I love when you get an idea in your mind and when you get it out it is exactly how you wanted it to be. That is what happened yesterday. Last weekend I had this vision for some art for a friend of mine and I knew I had to get some canvas. It’s a multimedia piece. 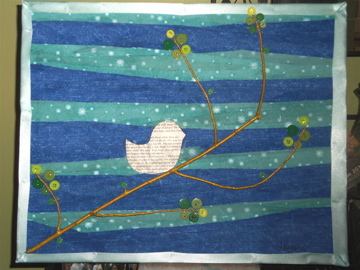 The background is fabric (attached with mod podge). Other elements include a stick I found outside and painted gold, a variety of buttons, and a poem I cut out in the shape of a bird. I just love how it all came together and it was so much fun to make. What do you all think? Adorable! I love the fabric background!